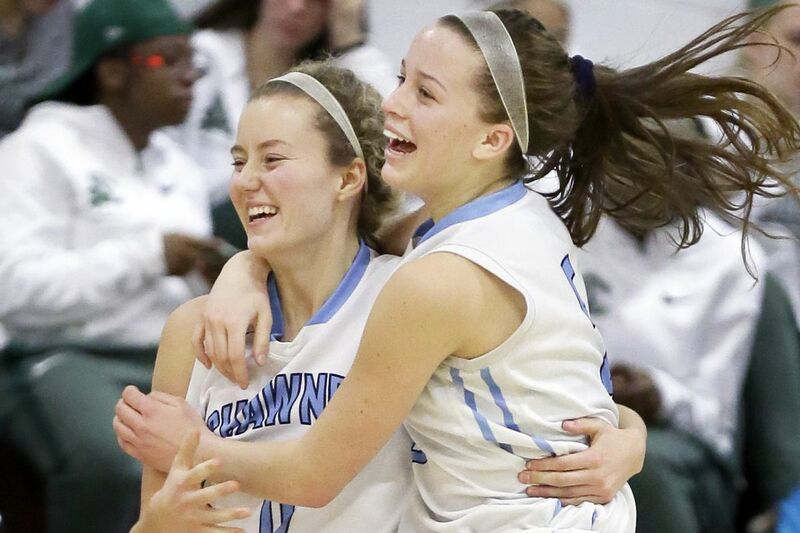 Shawnee’ Erica Barr (left) and Cameron Morgan celebrate after Barr’s game-winning shot. One Shawnee player sported a dog mask after the win, a nod to the trend that has persisted in the area since the Eagles won the Super Bowl. It might have seemed like more of a playful gesture if it wasn't so perfect for the moment, so fitting. You could almost hear Jason Kelce's booming voice in the energized post-game celebration. No one expected Shawnee to be here. But Erica Barr — the player who purchased the mask off Amazon last week — wriggled into the lane with two seconds left and hit a game-wining buzzer-beater. And the Shawnee girls' basketball team beat Bishop Eustace, 42-41, Friday night at Eastern to advance to the championship game of the South Jersey Invitational Basketball Tournament. The Renegades will take on reigning champion Cherokee for the tournament title — another game in which they are the clear underdog — Sunday at 4:30 p.m. at Eastern. Shawnee was coming off a loss to Bishop Eustace on Feb. 8. And Bishop Eustace was the hottest team in South Jersey, having knocked off most of the area's best over the last two weeks. "We view ourselves as the underdog every game," said Barr, whose clutch basket gave Shawnee its first lead since the first quarter when the score was 8-6. "We've been battling, and we've lost some close games this year. So we've been trying to change our mentality before the postseason." Sierra Sanson and Ciana Viccharelli led Shawnee with 11 points each. Barr and Cameron Morgan both chipped in seven. Outside of Barr's final bucket, the play of the game belonged to forward Lauren Lodge. A diving Lodge forced a turnover when she tipped an inbounds pass into a Bishop Eustace player, causing it to deflect out of bounds to set up the winning basket. "I was very nervous, but I knew we had to lock down on our defense," Lodge said. "We just wanted to make sure we kept our heads in the game and never got down." The game was close throughout, but Bishop Eustace (17-6) kept Shawnee (16-8) at arm's length for most of the game thanks to a gritty performance led by senior forward Katie McShea who generated 15 points, 10 rebounds and four blocks. Shawnee connected on six consecutive free throws in the opening minutes of the fourth quarter, tying the score at 36-36 with 5 minutes, 44 seconds left. But Bishop Eustace regained the lead and was ahead by 41-37 when freshman Katie Kempter drained a three-pointer to give the Renegades a 41-37 lead with 1:02 left. "The relentless effort, the fight, not giving up, that's what stands out," said Shawnee coach Chrissy McGovern, harkening more of the themes of the reigning Super Bowl champions. "I told [her players] after the game that the best thing was being in that huddle [when they were down in the fourth quarter], and I didn't even have to say that we're still in it. They said they were locked in." S: Sierra Sanson 11, Cameron Morgan 7, Erica Barr 7, Lauren Lodge 6, Ciana Viccharelli 11. BE: Julia Radley 6, Meghan McLaughlin 10, Katie McShea 15, Katie Kempter 5, Sophia Cross 3, Kaitlyn Dieter 2.